As with any intervention, selection of an appropriate access site is the critical first step toward success. In deep vein thrombosis (DVT) intervention, there are further challenges, as multiple access sites may be required, a large territory is usually treated, and venous valves can make retrograde catheterization difficult. This article reviews various access options for DVT interventions with the goal of providing a useful overview of the advantages and disadvantages of each approach. Figure 1. Axial venous phase CT demonstrating acute thrombus in the CFV (arrow) (A). Axial image at the level of the common iliac veins (CIVs) showing a diminutive right CIV (arrow) consistent with long-standing chronic occlusion (B). Patient safety and comfort, the ability to treat as much thrombus as possible, number of accesses needed, and the ability to deliver appropriate devices are all factors that must be considered before beginning a case. For these reasons, careful evaluation of all available imaging and examination of the patient are essential first steps. Cross-sectional imaging can often determine the extent of thrombus, relationship to major tributary veins, and, when possible, differentiation of acute from chronic occlusion. 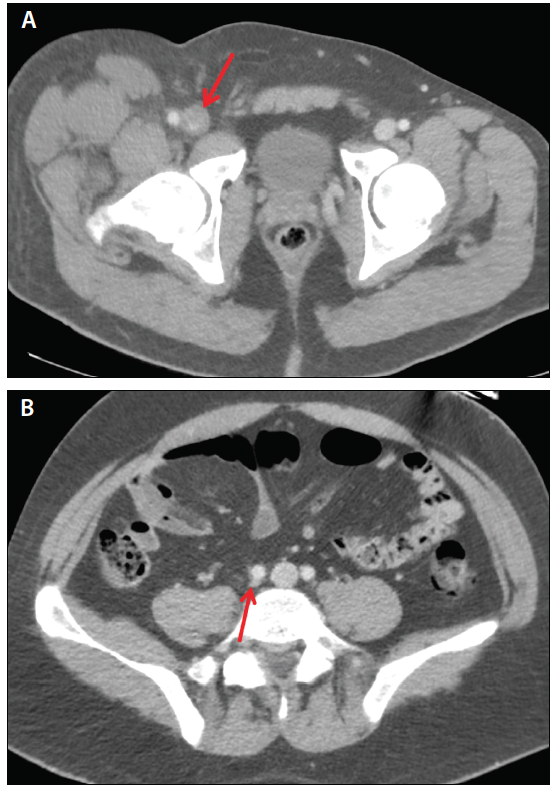 A venous phase CT can be very useful for assessing pelvic, abdominal, and mediastinal thrombosis (Figure 1). The physical examination should focus on clinical evidence of DVT, body habitus (especially the extent of pannus when femoral access is contemplated), skin integrity over potential access sites, and signs of malperfusion or phlegmasia. The presence of contractures, external devices, and mechanical impediments to access should also be examined. At this time, the patient’s ability to lie supine or prone for extended periods should be determined, and anesthesia support should be arranged if needed. Ultrasound (US) examination of all potential access sites by the person responsible for the access is critical to avoid wasted time reprepping patients during the procedure. A general principle is to choose an access site that is peripheral or central to the thrombus, depending on whether an antegrade or retrograde approach is planned. The goal is to treat the entire extent of the thrombus. However, this principle is commonly disregarded in lower extremity DVT when popliteal vein access is used in the presence of thrombus extending into the tibial veins. Whenever possible, access should not be attempted through a closed fascial compartment because access bleeding at that site can lead to compartment syndrome. The access vein should be large enough to accommodate any sheath that may be required; thrombectomy devices and some stents require 8-F or larger access. When selecting access for a procedure that could potentially continue as thrombolysis for several days, keep patient comfort and mobility in mind. Lower extremity access requires bed rest, whereas neck or upper extremity access allows for some mobility. Lastly, in some cases, multiple access sites may be required to facilitate thrombectomy, thrombolysis, or stent placement. Planning for this in advance is important in patients with present or past indwelling lines who may have limited access options. The standard tools for venous access in DVT interventions are US and 21-gauge microaccess needles with associated microwires and introducers. The visibility of the needle under US is essential for avoiding inadvertent arterial access, which is undesirable if thrombolytics will be required. When accessing a thrombosed segment of vein, there may be little blood return and guidewires may not advance freely. Thus, US confirmation of the needle tip in the vein lumen provides confidence that appropriate access has been achieved. A combination of US and fluoroscopic monitoring during the initial introduction of the guidewire may be necessary to ensure an intraluminal position. When femoropopliteal DVT extends into the calf, access via a tibial vein should be considered, with the recognition that all six of the tibial veins cannot be treated from a single access and access from multiple tibial veins is usually impractical. The most commonly accessed tibial veins are the posterior tibial veins because they drain a large volume of the calf, are relatively straight in course, and are superficial at the medial ankle (Figure 2). The patient can be positioned supine with the foot externally rotated. The vein should be accessed in the most superficial (peripheral) location possible because puncture in the calf itself traverses muscle and fascial planes. These veins are easier to work with when thrombosed because patent veins are subject to spasm, which can impede catheter movement. A limitation of tibial vein access is the size of the sheath that can be comfortably introduced. In smaller patients, a 6-F sheath (with an almost 8-F outer diameter) may be the largest size that can be tolerated. Figure 2. Axial grayscale US image of the posterior tibial veins at the ankle. The paired veins (arrows) can be seen on either side of the posterior tibial artery (A). 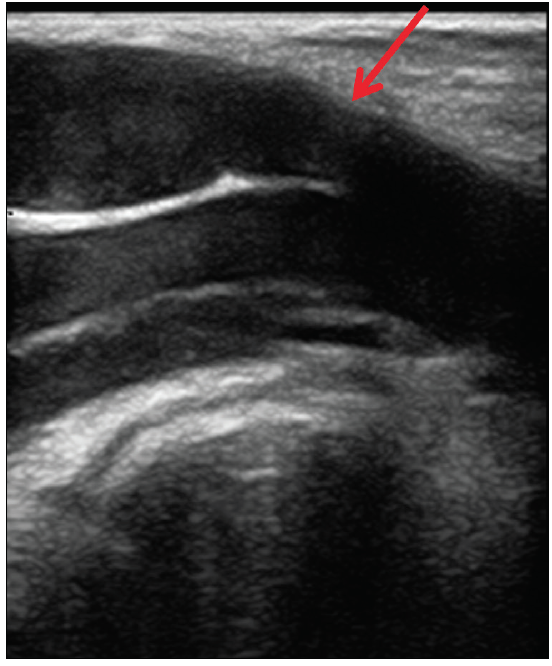 Longitudinal grayscale US image of a 21-gauge needle and microwire in one of the posterior veins (B). 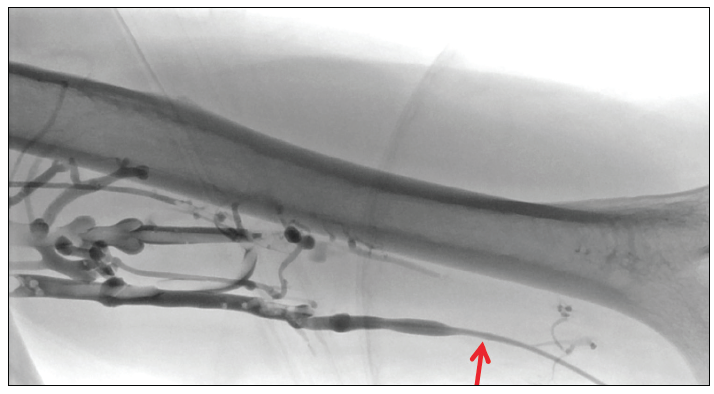 Spot image of a calf venogram with 5-F dilator in a posterior tibial vein (arrow) (C). Figure 3. Spot image of a thigh venogram with a 5-F dilator in the popliteal vein (arrow) (A). 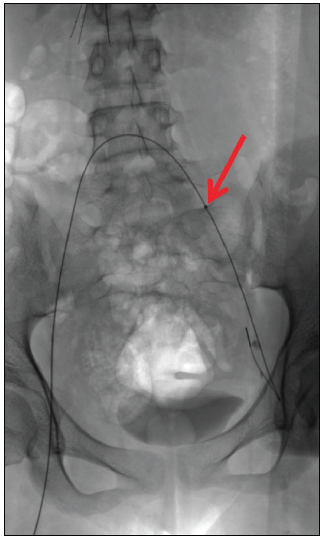 Spot image of a venogram at the level of the groin, showing thrombus in the FV (arrow) (B). Figure 4. Longitudinal grayscale image of the popliteal fossa, showing a dilated SSV (arrow) coursing deep toward the popliteal vein and a large gastrocnemius vein inserted into the posterior SSV. Popliteal vein access is often very tempting in patients with iliofemoral DVT, due to the fact that the vein is large and superficial to the artery when the patient is prone (Figure 3). Most devices and interventions can be accommodated from this access. Often, the major considerations for popliteal vein access are the patient’s ability to remain prone for the procedure and the inability to address tibial vein thrombus. The latter is important, as ensuring adequate inflow at the end of a procedure is necessary for maintaining patency. Access to the popliteal vein is usually in the popliteal fossa proper, although on fluoroscopy it never seems as low as one would expect from external landmarks and US. This access is well tolerated by most patients; however, they are usually supine in bed, making it more difficult to inspect the dressing while monitoring during thrombolysis. Popliteal vein access through the gastrocnemius muscle should be avoided to decrease bleeding risk. A useful variant of popliteal access is small saphenous vein (SSV) access (Figure 4). This approach requires conventional saphenous vein anatomy, with insertion into the popliteal vein rather than continuation as the Giacomini vein, and a saphenous vein of adequate diameter. The guidewire falls naturally into the popliteal vein with minimal manipulation. This is a preferred access in our practice because the vein is superficial and often inserts lower onto the popliteal vein than can be directly accessed with a needle. Access via the gastrocnemius vein is similar to SSV access but requires puncture into the posterior compartment. The risk of compartment syndrome should be considered before using this access. But, similar to SSV access, the guidewire readily passes into the popliteal vein very low in the popliteal fossa. Direct puncture of the femoral vein (FV) in the thigh is an alternative to popliteal access when the thrombosis is at the common femoral vein (CFV) level but extends peripherally. In the thigh, the FV is almost directly posterior to the superficial femoral artery when the patient is supine. Gentle external rotation of the hip can change the presentation of the vein to permit safe access. Access is deep and compression difficult due to the lack of posterior bony support, so the main consideration for thigh FV access is the exit strategy. Popliteal vein access is therefore often preferred to thigh FV access. Figure 5. “Up-and-over” access in preparation for thrombolysis of left iliac vein thrombus. The tip of the sheath (arrow) inserted from the right can be seen in the left CIV. Access via the CFV is familiar to proceduralists and supporting staff, provides a capacious lumen, and is easy to monitor. This is a reliable approach when thrombus is limited to the iliac veins and inferior vena cava (IVC), resulting in a dilated but patent CFV. If thrombus extends into the CFV, a more peripheral access (eg, popliteal vein) is desired to allow more extensive treatment. There may be instances in which retrograde access to the contralateral iliofemoral veins is desired. 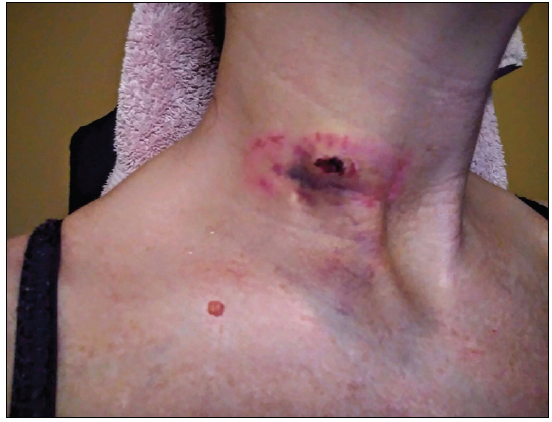 In these cases, either CFV access on the opposite side with use of a long flexible sheath, known as “up-and-over” access (Figure 5), or neck vein access can be used. This may be considered when thrombus extends into the profunda femoral vein (PFV) given that this is difficult to access with an antegrade approach. However, valves in the PFV and FV present a significant challenge for retrograde catheterization. The greater saphenous vein (GSV) is a useful alternative access to the CFV. The GSV can be accessed regardless of whether it is patent or thrombosed, and it is usually large enough to accommodate most devices. Access is gained on the upper anterior thigh and avoids the inguinal fold in patients with moderate pannus. Dressings are easy to monitor during thrombolysis, and bleeding does not seem to be a serious risk. The challenge with this access compared with the SSV is that the angulation of the saphenofemoral junction (SFJ) and the insertion of abdominal wall veins into the SFJ can make catheterization of the CFV challenging. Figure 6. Hematoma at a right IJV access site several days after the procedure. Figure 7. Right EJV with an arrow indicating the location and orientation of the access (A). Transverse US image showing a 21-gauge needle (arrow) about to enter the EJV, aiming centrally to the IJV. Puncture through the sternocleidomastoid muscle (SCM) is avoided with this approach (B). Internal jugular vein (IJV) access is as familiar and routine as CFV access. This access allows for an antegrade approach to the brachiocephalic veins and superior vena cava and a retrograde approach to the IVC, renal, and iliofemoral veins. There are no capacity limitations, and multiple accesses are possible when retrograde bilateral iliac vein thrombolysis is necessary. The FV and PFV can also be accessed, but valves will be encountered, as previously noted. Patients with short, thick necks can present challenges for IJV access. 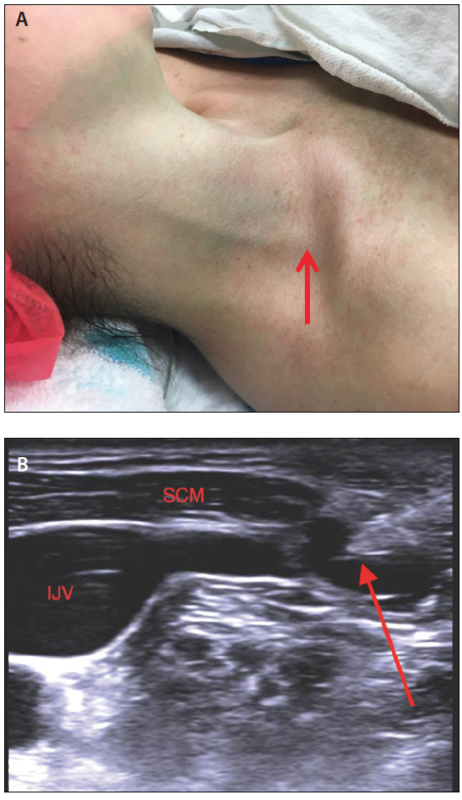 When possible, the IJV should be accessed through as little overlying sternocleidomastoid muscle as possible to minimize discomfort and bleeding risk. Bleeding, particularly during thrombolysis, can be troublesome. If extensive, it can cause airway compromise (Figure 6). A useful alternative to the IJV is the external jugular vein (EJV). This vein is much smaller than the IJV but can be accessed in the supraclavicular fossa because it turns medial to drain into the junction of the IJV and subclavian vein. The EJV can be accessed without traversing muscle, which decreases bleeding risk. This location is more comfortable for the patient and keeps the catheters away from the patient’s ear and mouth (Figure 7). Figure 8. Spot image of a left upper arm venogram after access of the basilic vein (arrow) low in the arm, showing thrombus in the basilic and brachial veins. Basilic vein access is most often utilized for treatment of axillosubclavian or more central mediastinal vein thrombosis (Figure 8). The advantage of the basilic vein is that in the distal upper arm, it is superficial to the neurovascular bundle. This vein usually inserts into the high brachial vein or peripheral axillary vein, permitting effective treatment of thrombosis related to thoracic inlet compression and stenosis. If this vein is not available, brachial vein access can be utilized. This vein is deeper, and the adjacent artery and nerves increase the risk of an access complication. If a desired access vein is chronically occluded, there may be an enlarged collateral vein that can be used for access. The challenge with collateral vein access is that the path can be too small, or it can be too tortuous to allow insertion of stiffer devices. 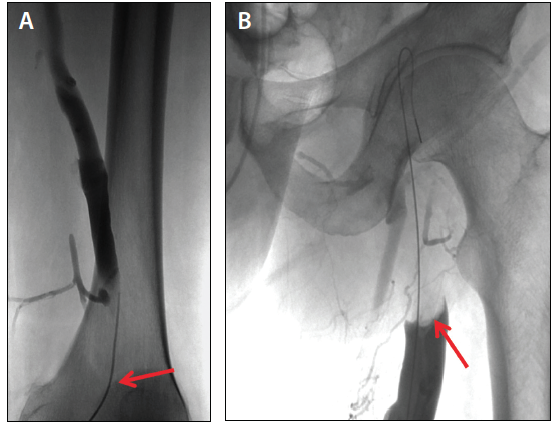 Recanalization of occluded access veins should also be considered when feasible. A common scenario is discovery of a central IJV occlusion after access in the cervical portion of the vein. If this can be crossed atraumatically, the access can then be used for the DVT intervention. If the occlusion is asymptomatic, then stenting is not necessary after the procedure is concluded. In addition to the options discussed throughout the previous sections, several other alternate venous access approaches exist but are not usually appropriate for DVT interventions. These include translumbar puncture of the IVC, transhepatic access to a hepatic vein or the IVC, and direct suprasternal access to the left brachiocephalic vein.1 The risk of access site bleeding with these alternative approaches limits their utility in DVT interventions, but they can be useful for patients requiring long-term central venous access with loss of the usual access sites. Careful selection of venous access for DVT intervention improves the chances of a successful procedure. With some creativity, most patients can be safely accessed using the approaches described herein. 1. Weeks SM. Unconventional venous access. Tech Vasc Interv Radiol. 2002;5:114-120. Disclosures: Consultant to Argon Medical Devices, Cook Medical, and optimed Medizinische Instrumente GmbH.